My Comments: Apart from my concern that many of us will wake up one day soon and discover much of our money has disappeared, it is helpful to understand where all the gains have come from since the last significant crash in 2008. Who’s responsible for the bull market: Trump, Obama, Bernanke, Yellen? Answer: Tech companies. Here’s a look at what’s really driving growth. As Wall Street’s raging bull continues its historic charge, there has been plenty of chatter about who deserves the credit: Mr. Trump? Mr. Obama? Former Fed chairs Ben Bernanke or Janet Yellen, perhaps? But the answer seems not to be a “who” but rather a “what”: tech companies. 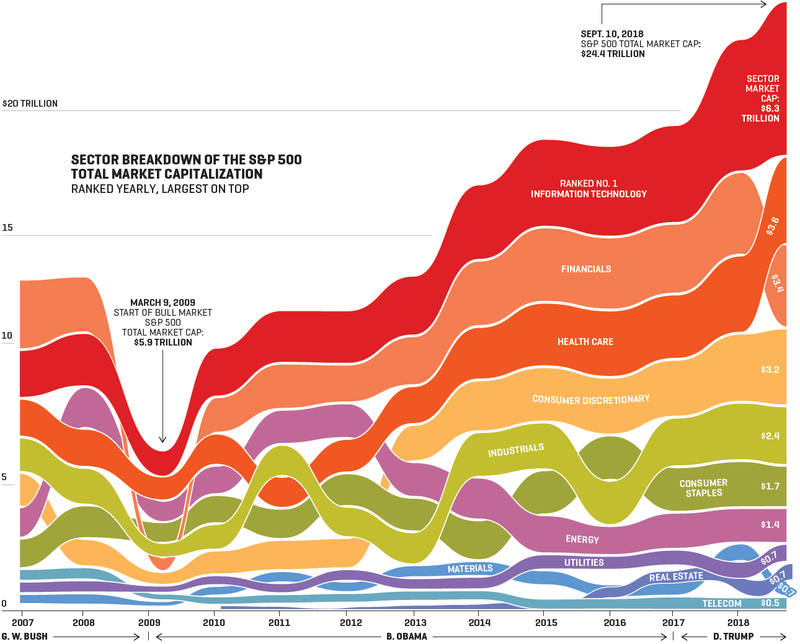 From the market bottom in 2009 to now, the capitalization of companies listed in the S&P 500 index grew by more than $18 trillion. But three of every 10 dollars in gain came from the 73 tech companies in the index. And the true bull market of the past decade was even narrower than that. Nearly 16% of the market cap growth derived from just four stocks: Apple, Alphabet, Microsoft, and Facebook. Their combined valuations soared from just over $300 billion to more than $3 trillion.